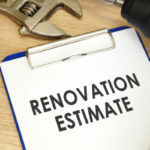 Sometimes you need a complete kitchen remodel, at other times you only need to make an upgrade or two to accomplish your goal. 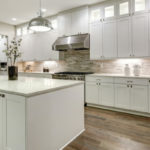 When the time comes to replace that kitchen faucet, how do you wade through the multitude of faucets available on the market to find the one that is the perfect fit for you and your kitchen? After all, there are classic models, tech-savvy innovations, pull-downs, pull-outs, stream, spray, hands free, dual lever, single lever, and the list goes on. What seemed like a simple upgrade is now an overwhelming selection from a myriad of options. Let’s explore the options and help you decide. Pause Flow – Some faucets allow you to pause the flow of water if you are working at your sink, but are still filling pots, pans, and such. Pull Out Designs – With a spray head, pull out designs offer added flexibility. Pull Down Designs – The perfect choice if you simply want to rinse things in your sink. MotionSense aka “Hands Free Technology” – The ideal solution if you prep and cook a great deal, these faucets allow you to wash your hands easily. They are also great for families with children who are in and out of the kitchen – washing hands, for a drink of water, and so on. What Design Suits Your Style? When making your faucet selection, you should consider the overall layout of your faucet. For instance, a side spray design requires an added whole for installation while a pull out doesn’t. 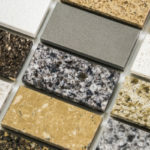 If your family is large, you may want to choose a finish that is fingerprint resistant. Ergonomic handles are also an important design feature in some households. Another consideration is faucet swivel, some faucets don’t swivel while others swivel 360 degrees and either could be problematic depending on your overall kitchen design. What Specific Style Options Do You Appreciate? The Two Lever – A classic faucet, the two lever has hot and cold handles which precisely control both water flow and temperature. They can be mounted on the sink or separately. The Single Lever – Another traditional faucet (at least since the 1950s, the single lever has a joystick control for water flow (vertical) and temperature (horizontal). Pull-Down – With a pull-down, the spout head feeds water through a hose in the spout that can be pulled down and used where it is needed. A counterweight retracts the hose when the task is complete. 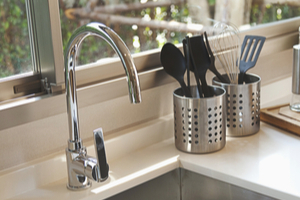 Pull-Out – The pull-out faucet with it long, flexible hose allows you to easily rinse pots, pans, and veggies. Spray/Steam Selector – This handy faucet’s nozzle can be switched from spray to stream easily and back again. In most models, the faucet resets to stream when turned off. Hands-Free – Also know as MotionSense faucets, the hands-free faucets use a motion sensor which detects hands or dishes and turns on automatically. Touch Faucets – Touch faucets feature programming for multiple water flow and temperatures which is activated by the number of touches on the faucet body. Touch faucets are convenient and easy to operate. 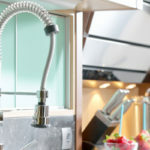 Commercial Faucets – Quickly finding a place in home kitchens, industrial faucets can handle a multitude of jobs in a short period of time making the perfect addition to busy home kitchens.